තමන් මුහුණ දී සිටින අස්ථාවරභාවයෙන් මිදීම සඳහා ආණ්ඩුව තෙල්දෙනියෙන් ඇරඹි සිංහල – මුස්ලිම් ගැටුම සමනය කිරීමට පොලීසිය යෙදවීම මග හැර සිටීමෙන් එම ගැටුම වෙනත් ප‍්‍රදේශ කරා වේගයෙන් පැතිර ගිය බවත් ඒ නිසා ජීවිත හානි, දේපළ හානි මෙන්ම ජාත්‍යන්තර වශයෙන් රට අපකීර්තියට පත් වීම ද සිදු වූ බවත් මේ ගැටුමේ සම්පූර්ණ වගකීම ආණ්ඩුව විසින් භාර ගත යුතු බවත් ජාතික නිදහස් පෙරමුණ පවසයි. පිටකෝට්ටේ පිහිටි ජාතික නිදහස් පෙරමුණේ ප‍්‍රධාන කාර්යාලයේ දී පැවැති මාධ්‍ය හමුවකට එක් වෙමින් ජානිපෙ ප‍්‍රචාරක ලේකම් මොහොමඞ් මුසම්මිල් මහතා මෙසේ පැවසීය. එහිදී වැඩිදුරටත් අදහස් දැක්වූ ඒ මහතා මහතා මෙසේ ද සඳහන් කළේය. ‘මේ වන විට තෙල්දෙනිය ප‍්‍රදේශයෙන් ඇරඹි මහනුවර දිස්ත‍්‍රික්කය පුරා පැතිර ගිය ගැටුම්කාරී තත්ත්වය සමනය කිරීම සඳහා මැදිහත්වීම ආණ්ඩුව ඉතාමත් සැලසුම් සහගතව මග හැර තිබෙන බව ඉතා පැහැදිලියි. ඒ වගේම මේ ගැටුම්වලට මුල් වූ මැර පිරිස්වලට ඇණ්ඩුවේ අනුග‍්‍රහය නොමදව ලැබුණු බවටත් බොහෝ සාක්‍ෂි තිබෙනවා. තෙල්දෙනිය අම්බාල ප‍්‍රදේශයේ විසූ කුමාරසිංහ සහෝදරයාගේ ඝාතනයත් ඊට නීතිය ක‍්‍රියාත්මක වීමේ ප‍්‍රමාදයත් හේතු කොට ඇතැම් ජාතිවාදී අන්තවාදී පිරිස් ගැටුමකට අර අඳින බව හොඳින් දැක ගත හැකි වුණා. ඒ බව කල් තියා අවබෝධ කරගත් ප‍්‍රදේශයේ බෞද්ධ භික්‍ෂූන්වහන්සේලා, මුස්ලිම් ආගමික නායකයන් හා දිගන නගරයේ ව්‍යාපාරික ප‍්‍රජාව කුමාරසිංහ සහෝදරයාගේ අවසන් කටයුතු යෙදී තිබූ මාර්තු 05 වැනිදා දිගන නගරයේ කඩ සාප්පු වසා දැමීමට තීන්දු කර තිබුණා. පොලීසියට මේ තත්ත්වය නොවැටහී තිබෙන්න හැකියාවක් නැහැ. මාර්තු 05 වැනිදා මා සිටියේ ද දිගන ප‍්‍රදේශයේ. එදින උදේ 10 – 11ට පමණ මා දිගන නගරය පසුකර යන විට දුටුවා, නගරය පුරාවටම ආරක්‍ෂාව සඳහා තිබුණේ එකම විශේෂ කාර්ය බලකා ජීප් රථයක් බව. ආරක්‍ෂක වැටවල් වෙනුවට රථ වාහන පොලීසිය යොදා ගන්නා ‘ප්ලාස්ටික් කෝන්’ යොදා තිබුණා. ගැටුම්කාරී තත්ත්වයක් ඇති වුවහොත් ඊට මැදිහත්වීමේ කිසිදු පූර්ව සූදානමක පොලීසිය නොසිටි බව මා සියැසින්ම දුටුවා. ඒ වගේම යුද හමුදාපතිවරයා පැවසුවා ‘පොලීසිය බලාගෙන ඉඳිද්දි පහර දුන්නා කියා ජනතාව චෝදනා කළා. හමුදාව එන විට බොහෝ ස්ථාන ගිනි අරන් අවසන්. පොලීසිය මෙම සිදුවීම මැඩ පැවැත්වීමට අපොහොසත් වී තිබෙනවා’ කියා. ඒ වගේම ආණ්ඩුවේ ඇමතිවරයකු චෝදනා කළා ‘පිටතින් පැමිණි මැර පිරිස්වලට පහර දී පලා යෑමට පොලීසිය පැයක කාලයක් ලබා දී තිබුණා’ කියා. මෙවැනි අවාසනාවන්ත තත්ත්වයක් නිර්මාණය කිරීමට අවශ්‍ය වී තිබුණේ කාට ද? පසුගිය මාර්තු 05 වැනිදායින් ඇරඹි සතිය තුළ තමයි අග‍්‍රාමාත්‍ය රනිල් වික‍්‍රමසිංහ මහතාට එරෙහි විශ්වාසභංගය ඒකාබද්ධ විපක්‍ෂය විසින් පාර්ලිමේන්තුවට ඉදිරිපත් කිරීමට නියමිතව තිබුණේ. ඊට එක්සත් ජාතික පක්‍ෂයේ පාර්ලිමේන්තු මන්ත‍්‍රීවරුන්ගේ සහාය ද ලැබී තිබුණා. පාලිත රංගෙබණ්ඩාර වැනි එජාප මන්ත‍්‍රීවරුන් රනිල් වික‍්‍රමසිංහ මහතාව ප‍්‍රසිද්ධියේ විවේචනය කරමින් තිබුණා. ආණ්ඩුවේ ශ‍්‍රී ලනිප ඇමතිවරුන් බොහෝ දෙනකු ද රනිල් වික‍්‍රමසිංහ අගමැති ධුරයෙන් ඉවත් කළ ආණ්ඩුවක් ගැන සාකච්ඡුා කරමින් සිටියා. ඒ විදියට ආණ්ඩුවේ අස්ථාවරත්වය රජයන කාලයක් තමයි මේ ගැටුම ඇරඹි මාර්තු 05 වැනිදාට පෙර තිබුණේ. ඒ වගේම පළාත් පාලන මැතිවරණයෙන් පොහොට්ටුව ලැබූ විශිෂ්ට ජයග‍්‍රහණය යටපත් කිරීමේ උවමනාවක් ද ආණ්ඩුවේ කණ්ඩායම්වලට තිබුණා. ඒ වගේම ආර්ථික බිඳ වැටීම, අර්ජුන් මහේන්ද්‍රන් හිටපු මහ බැංකු අධිපතිවරයා සොයා ගැනීමට බැරි වීම ආදී ප‍්‍රශ්නත් මේ අයට තිබුණා. ඉතිං ආණ්ඩුව විශ්වාස කළා මෙවැනි ගැටුම්කාරී තත්ත්වයකට ඉඩ සැලසීමෙන් තමන් මුහුණ පා සිටින අස්ථාවරත්වයෙන් මිදෙන්න පුළුවන් කියා. මෙවැනි ගැටුමකින් පසුව ඉතා පැහැදිලිව වාසිය ලැබෙන්නේ මේ ආණ්ඩුවටයි. සැලසුම් සහගතව පොලීසිය ගැටුම් නිරාකරණය සඳහා නොයොදවා ගැටුම් උත්සන්න වීමට ඉඩ හැරි ආණ්ඩුව මේ අවාසනාවන්ත තත්ත්වයට සම්පූර්ණයෙන්ම වගකිව යුතුයි. නීතිය හා සාමය අමාත්‍යාංශය භාර අමාත්‍යවරයා ලෙස රනිල් වික‍්‍රමසිංහ මහතා මේ ගැටුම සමනයට කිසිදු ක‍්‍රියාමාර්ගයක් නොගත්තේ ඉතාම සැලසුම් සහතවයි. ඔහු ඇමතිවරයකු ලෙස සම්පූර්ණයෙන්ම අසමත් කියා රටට පෙන්වූවා. 1983 කළු ජූලිය අවස්ථාවේදීත් මෙවැනි පූර්ව සැලසුමකට අනුවයි සියල්ල සිදු වුයේ. පෙළපාලියකින් එනවා, පළමුව කඩ සාප්පු මංකොල්ල කනවා. ඊට පසුව ගිනි තියනවා. මෙවැනි සැලැස්මක් අතේ තියා ගෙනයි එදා සිරිල් මැතිව්ලා කළු ජූලිය දියත් කළේ. දිගන, අකුරණ ආදී තැන්වල මේ බව ඉතා පැහැදිලිව දැක ගත හැකියි. මුස්ලිම් ජනතාව වෙසෙන ප‍්‍රදේශ හරහා මෙවැනි පෙළපාලි එනකොට ඒ දෙපස තිබෙන අතුරු මාර්ගවලට රැකවල් ලා ගෙන මුස්ලිම් ජනතාවගේ නිවාස හා දේපළවලට රැකවරණය සැලසුවේ ඒ ප‍්‍රදේශවල බෞද්ධ භික්‍ෂූන්වහන්සේලා, සිංහල බෞද්ධ බැතිමතුන්. පෙළපාලි ගියේ, කඩ සාප්පු මංකොල්ල කෑවේ, ඒවා ගිනි තැබුවේ පිටතින් ආ මැර පිරිස්. ඒ නිසා ඉතා පැහැදිලිව පෙනෙනවා, මේ ගැටුම කෘත‍්‍රිමව ඇති කරපු එකක් කියා. 1983 දී දෙමළ ජනතාවට පහර දුන්නේ ඇඳිරිනීතිය මැද්දේ. මෙවරත් මුස්ලිම් ජනතාවට පහර දුන්නේ ඇඳිරිනීතිය මැද්දේ. ගැටුම් සමනය කරන්න පොලීසිය මැදිහත් නොවීම, සියල්ල සිදු වී අවසන් වුණාම හමුදාව යෙදවීම ආදී මේ සියල්ලෙන් පෙනෙන්නේ මේවා ආණ්ඩුවේ අනුග‍්‍රහය, ආධාරය, අනුබල මත සිදු වූ ඒවා බවයි. 1983 කළු ජූලියෙන් පසුව සිදුවූයේ බහුතර දෙමළ ජනතාව කොටි ත‍්‍රස්තවාදය දෙසට, ප‍්‍රභාකරන්ගේ තුරුළට තල්ලූ කර හැරීම. එදා දෙමළ ජන සමාජය, ප‍්‍රභාකරන් ඇතුළු දෙමළ ජාතිවාදී බෙදුම්වාදී, බලවේගවල සරණ පතන තැනට පත් කළා. මෙතැනදී සිදු කරන්න හදන්නෙත් ඒකයි. සැලසුම් සහගතව මෙවැනි ගැටුමක් නිර්මාණය කළාම විවිධ මානසිකත්වයන්හි සිටින ආවේගශීලී තරුණ පිරිස් ගැටුම්වලට මැදි කර ගන්න පහසුයි. මෙවැනි සිදුවීම්වලින් දීර්ඝකාලීනව රටට සිදු වන හානිය ඉතා බරපතළ බව තේරුම් ගත යුතුයි. ආණ්ඩුව වගේම මෙවැනි ගැටුමකින් වාසිය ලබන්නේ ජාතිවාදී, අන්තවාදී කල්ලි කණ්ඩායම්. මෙතෙක් කලක් මුස්ලිම් ජනතාව බහුතරයක් ප‍්‍රධාන දේශපාලන පක්‍ෂ වටා රොක් වෙලා සිටියා. නමුත් මේ ගැටුමෙන් පසුව මුස්ලිම් අන්තවාදී කණ්ඩායම්වලට ඉඩක් ලැබෙනවා. ඔවුන්ව බෙදුම්වාදය දෙසට රැුගෙන යාමට. අද මුස්ලිම් සමාජය තුළ මේ අන්තවාදී කොටස් සූක්‍ෂ්ම මතයක් හදනවා ‘අපට සිංහල ජනතාවගෙන් පිහිටක් නැහැ. අපේ ආරක්‍ෂාව අපිම සලසා ගත යුතුයි. අපි බෙදුම්වාදයේ පිහිට පැතිය යුතුයි’ කියා. ඒ අනුව අයිඑස්අයිඑස් වැනි අන්තවාදී සංවිධානවලට ශ‍්‍රී ලංකාව තුළ පැලපදියම් වීමේ ඉඩකඩ නිර්මාණය කර දීමයි මේ ගැටුමේ නිර්මාතෘවරුන් සිදු කළේ. මේ ගැටුම් නිර්මාණය කළ පිරිස් බෞද්ධ භික්‍ෂූන්වහන්සේලා සතු බලය, වටිනාකම් පද්ධතිය හෑල්ලූවට ලක් කිරීමට ද උත්සාහ කරමින් සිටිනවා. ජාත්‍යන්තර මාධ්‍ය යොදා ගනිමින් උලූප්පන්න හදනවා ‘බෞද්ධ භික්‍ෂූන්වහන්සේලා මෙම ගැටුම් අවුලූවන්න මැදිහත් වුණා’ කියා. ඇත්තෙන්ම සිදු වුණේ බෞද්ධ භික්‍ෂූන්වහන්සේලා මේ ගැටුම් ඇවිලී යාම වැළැක්වීමයි. නමුත් බෙදුම්වාදී ව්‍යවස්ථාවට, රටට අහිතකර කවර හෝ කරුණකට එරෙහිව පෙරට එන භික්‍ෂූන්වහන්සේලා නිහ`ඩ කරවීම මේ ආණ්ඩුවේ සහ ඔවුන්ගේ බටහිර හාම්පුතුන්ගේ උවමනාවයි. ඒ සඳහා ද මේ ගැටුම යොදා ගත් බව පැහැදිලියි. ආණ්ඩුවට වගේම අපේ මාතෘභූමිය තම ග‍්‍රහණයට ගැනීමට බලා සිටින බලවේගවලට සහ සියලූ ආකාරයේ අන්තවාදී කොටස්වලට පමණයි මෙම ගැටුමෙහි වාසිය ඇත්තේ. මෙම මාධ්‍ය හමුවට ජානිපෙ ත‍්‍රිකුණාමල දිස්ත‍්‍රික් නායක සුනිල් අමරසිංහ සහ කොටිකාවත්ත මුල්ලේරියාව ප‍්‍රාදේශීය සභා මන්ත‍්‍රී හේමසිරි අමරසිංහ යන මහත්වරු ද එක්ව සිටියහ. It is easy to blame each other ( politicians). 35 years passed since 1983 and Intelligent Sinhala people do not rule out the theory that it was orchestrated by LTTE and TULF. Tamil language speaking police and other responsible officials are there at very high positions then and now. We are not ruling out this was orchestrated by radical Muslims and muslim politicians of all parties including NFF. LTTE killed 12 solidiers. 4 Muslim thughs killed a Sinhala driver for no aparent reason. Riots allowed by police in both cases. Soon after riots governement blamed JVP and this time MB. They did not arrest rogue monks but people who expose Muslim evil to Sinhala people were arrested, similar to 1983 JVPeers were arrested. Only ONE disable Muslim youth was working at all Businesses during night and lights went off. Is it ususal to all Business people to go back home soon after night ? Busnesses shown by MB were targetted and torched, knowing that much better buildings would sure to be constructed by the governement and with the aid of Arabs and Jihadists afterwards. Not only Buddhist monks but also MB were clearly seen trying to avoid clashes. Why did the monk form Baticaloa came to Kandy ? Why did the monks from Colombo came to Kandy ? For the same reason MB too came there. There is no excuse for JO to organise no confidence motion. Actually this is another proof of loss of confidence of ‘law and order minister’ in charge at that time. JO waiting for UNP to do it and UNP is waiting for JO to do it and JVP putting conditions to support it. It will never happen. There is an URGENT NEED to UNRAVEL the TRUTH of who INSTIGATED the RECENT Communal CONFLICT. There are MANY FALSE-FLAG ACTIVITIES UNDERWAY to MISDIRECT investigators and HIDE the TRUTH! Some are pointing to UNP Govt Ministers, others to Opposition Politicians, others to Sinhala Movements such as the Mahason Balakaya, still others to Muslim jihadists, and some to Tamil Separatist Eelamists trying to leverage the UNHCR review in Geneva! 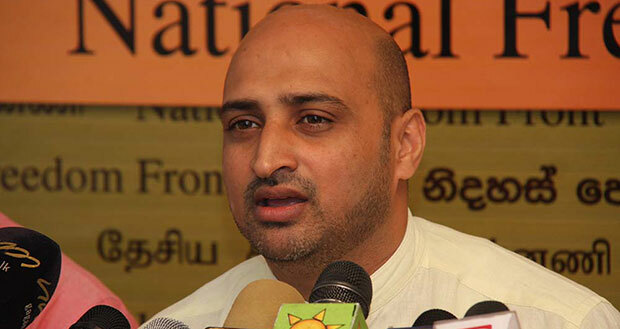 The UNP-faction of the Yamapalana Govt has ALREADY BEGUN pointing fingers at the joint opposition, in an attempt to TRANSFER the BLAME from itself to its opponents. Since the UNP-faction of the Yamapalanaya is the PRIMARY BENEFICIARY of these attacks, the INVESTIGATION CANNOT BE LEFT to be CONDUCTED by it. This 3-person Presidential Commission of Inquiry (see below) appointed by President Sirisena is perhaps the VERY BEST of the BAD CHOICES AVAILABLE to handle this task, lacking a TRULY PATRIOTIC Govt in Power. Sat, Mar 10, 2018, 11:45 am SL Time, ColomboPage News Desk, Sri Lanka. Mar 10, Colombo: Sri Lankan President Maithripala Sirisena has decided to appoint a Presidential Commission of Inquiry to investigate the communal clashes erupted in certain parts of the Kandy District during the past few days. Accordingly, a committee comprising three retired judges will be named in future. The Committee will investigate whether any violation of law and order is among the reasons for the clashes, evaluate the damages to lives and properties, probe whether there was any conspiratorial hand behind the incidents, recommend steps need to be taken to prevent such incidents in the future, and look into the conduct of relevant authorities in controlling the situation and their accountability. According to police, three people died, 20 others were wounded and more than 200 Muslim-owned businesses and homes were destroyed in four days of rioting that started on Monday following the funeral of a Sinhalese man, who died from injuries sustained in an assault by Muslim youths. The government deployed the tri forces and imposed a curfew from Wednesday in the Kandy Administrative district when the police were unable to control the Sinhala mob attacking Muslim establishments, shops and mosques. This entry was posted on Sunday, March 11th, 2018. You can follow any responses to this entry through the RSS 2.0 feed. You can skip to the end and leave a response.